Witton offers a first class service to manufacture fine chemicals & polymers and to dry powders. New products and processes are taken quickly and efficiently from the laboratory, through scale up and into full scale production. The need to meet tight deadlines, in order to take advantage of new opportunities in the market, is well understood and Witton has a track record of turning enquiries into business in a short time frame. An adaptable plant and a wide range of vessels means that the contract manufacturing service can continue, beyond scale up and development, to full scale production. The company has provided many customers with long years of service. 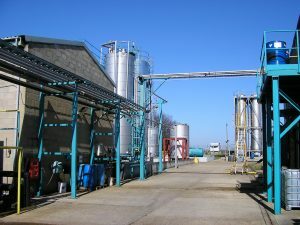 Plant and equipment can be dedicated to a customer’s production when required. Witton is pleased to undertake toll manufacturing campaigns that range from producing hundreds of kilos to thousands of tons of material per year and finished products may be dispatched in kegs, drums, bags, FIBCs or bulk loads to anywhere in the world. Bulk storage for raw materials, intermediates and finished products is available. Raw materials and packaging may be purchased by Witton or received on consignment. Our logistics team is skilled at sourcing new materials and finding cost effective ways to send products all over the globe.